Two Girls Found a Way to Help Across the World! 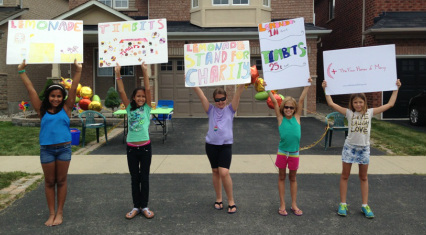 10-year old Kara and Emma raised $330 in Toronto, Canada, from running a lemonade stand in front of their house for 2 days! There are many ways in which you can get involved to support the mission of the Four Homes of Mercy. We need many volunteers - as many as we can get to help us - in our day-to-day activities. Can you give us some of your precious time? Please come and visit us if you can. We even offer limited boarding facilities. If you are in the healthcare industry – be it as a doctor, nurse, therapist - there are many ways in which your skills can be an asset to our residents and staff. Our residents and staff cherish the time we spend with visitors and the rich companionship that they bring. Please don’t underestimate the lasting value that a warm voice and sweet smile can have on people! Some of our residents don’t even have family members to visit them. Help with resident domino tournament, blow bubbles to a child to help the child work on coordination, sort supplies, wheel residents to the garden for fresh air, entertain, help with feeding. Please note that, for some activities, language is not an obstacle for your involvement if you don't know Arabic. Please contact us to arrange your volunteer activity with us! We rely on aid and individual funding to run our operations. Consider organizing a fundraising event in your community, school, your work. Please contact us for ideas. Consider utilizing a big personal challenge for yourself as a fundraising tool for the Homes such as a marathon, a triathlon, a swimathon or a cycling event. Pledge to train and complete the challenge and seek funding support for the Homes from your network of friends. Please let us know of your initiative and successes! Click the link below or visit the Donate page to find out how to donate by check. Please tell your friends, your company and your community about our wonderful mission and help support us in any way you can!